This major injection of funding for coastal communities will go towards supporting innovative businesses, protecting historic buildings, new museums and restoration of much-loved coastal heritage sites. This latest investment represents 26 awards from the fifth round of the government’s Coastal Communities Fund and 44 awards from the third phase of the Coastal Revival Fund in 2018-19. It comes on top of over £180 million from both funds invested in more than 350 projects so far across the UK. The 26 Coastal Communities Fund projects announced today (23 March 2019) are forecast collectively to support over 15,000 jobs, and attract up to £40 million in additional investment from public and private sector sources. I am determined to support investment and development of our coastal communities and create an economy that works for everyone as we prepare for Brexit and beyond. All of the ambitious projects receiving funding today were designed and developed by local people who know what will make the biggest difference to their areas. The sheer range of ideas demonstrate the potential of our coastal communities and will all create good jobs, boost growth and improve people’s lives now and in the future. 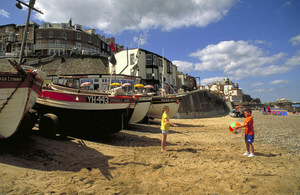 This is an investment in the future of our coastal communities which builds on their rich heritage and huge potential. The world-class attractions and innovative businesses supported by the Coastal Communities Fund and the Coastal Revival Fund will increase tourism, encourage investment and ensure people thrive up and down the Great British Coast. Today’s investment in coastal communities builds on the government’s commitment to ensure people have the opportunities to prosper no matter where they live. The government recently announced the Stronger Towns Fund, a £1.6 billion investment which will enable new Town Deals across England, and the delivery of locally led projects creating new jobs, providing further training to help people gain valuable skills for employment, and boosting local growth. £396,000 awarded to the Bord Waalk – National Bird Sculpture Trail in Amble to create a bird themed sculpture trail of national significance to build on the highly successful Harbour Village project and raise the profile of Amble as a tourist destination. £1.06 million awarded to a project to improve visitor infrastructure, facilities and activities along Cumbria’s ‘hidden’ coast to create new visitor demand and enhance the coastal destination offer. £1.75 million awarded to deliver the AMUSEUM – Britain’s first museum telling the story of Blackpool and its role in the development of British popular entertainment and the great British seaside holiday. £472,000 awarded to establish England’s first commercial seaweed hatchery, cultivation site and outreach centre in Scarborough, driving economic growth by creating sustainable jobs in sectors currently offering few opportunities in the area. £50,000 awarded to implement Seafront Improvement (promenade access works) for improved coastal protection and coastal access along a 240 metre frontage. £50,000 awarded to conduct work to prevent further structural deterioration of the pier and to undertake work to promote its historical value to the many people that use it. The Coastal Communities Fund (CCF) was introduced in 2012 and supports projects in the UK delivering sustainable growth and jobs in coastal areas. The Coastal Revival Fund (CRF) was introduced in 2015 to help coastal areas bring at risk heritage and community assets back into economic use. Applications to the current round of CRF were invited in summer 2018.